A race of giant gastropods has taken over the planet Jaconda. Their leader, Mestor, now intends to cause an enormous explosion in order to spread his people's eggs throughout the galaxy, and he kidnaps juvenile twin geniuses from Earth to work out the necessary mathematical equations. Space fighters led by Lieutenant Hugo Lang are dispatched to get the twins back, but they come under attack and Lang is the sole survivor when his ship crashes on the asteroid Titan 3. 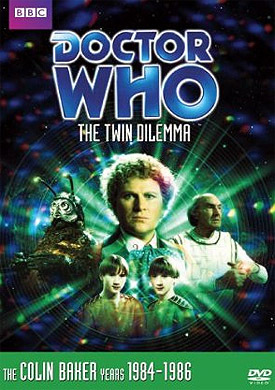 The Doctor and Peri become involved and help Jaconda's elderly former ruler Professor Edgeworth, who is really a Time Lord named Azmael, to defeat Mestor and free the planet's bird-like indigenous people from the gastropods' reign of terror. • Commentary with actors Colin Baker, Nicola Bryant and Kevin McNally. • The Star Man (dur. 6' 03") - an interview with title sequence designer Sid Sutton. • Look 100 Years Younger (dur. 11' 46") - Colin Baker and comedian Amy Lamé discuss the Doctor's costumes over the years. • Stripped for Action - The Sixth Doctor (dur. 17' 45") - a look at the Sixth Doctor's comic strip adventures from the pages of Doctor Who Magazine. Featuring interviews with artist John Ridgway, writer Simon Furman, former Doctor Who Magazine editors Alan McKenzie, Gary Russell and Alan Barnes. • Breakfast Time (dur. 9' 53") - Colin Baker and Nicola Bryant interviewed by Frank Bough and Selina Scott on the BBC's breakfast TV show. • Blue Peter (dur. 10' 01") - Colin Baker interviewed by Janet Ellis on the long-running childrens' magazine show. • Continuity (dur. 3' 12") - BBC1 continuity announcements from the story's original transmission. • Photo Gallery (dur. 8' 04") - production and publicity photos from the story.